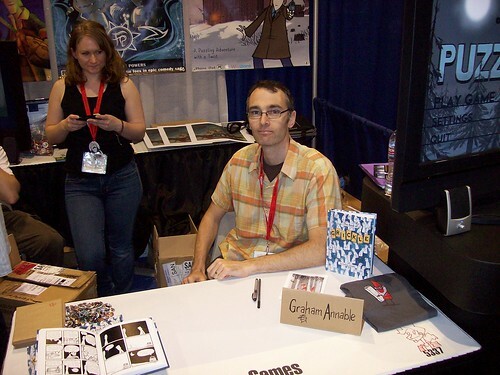 Below, I ramble about Comic-Con in general, and cover a little actual Comic-Con 2010 stuff. If you like, you may skip forward to Part 3. 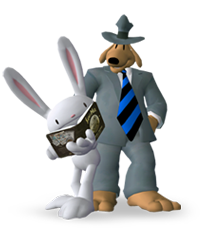 That is, after all, where the interesting LucasArts/Telltale Games stuff can be found. I just felt the need to expand my blog a bit this year. Comic-Con. Just a few short years ago, I would have never dreamed of attending such an event, but in October 2007, I was given my first taste of a convention experience when Telltale Games offered free passes to E for All Expo. That particular event was a bit of a flop, but it still managed to wet my appetite for that following year's Comic-Con. I was excited and terrified at the same time. I had never attended anything of this magnitude. Eventually, I overcame my nerves, though, and found that it was a thoroughly enjoyable experience. When I met the Telltale Games crew for the first time, I could feel a certain degree of magic in the air. That may sound weird, but I can think of no better way to describe that feeling. However, in the years since, I have begun to tire of Comic-Con. First off, the massive crowds are beginning to drive me insane. If someone handed me a lightsaber, I might actually think about using it to cut through some of the excess limbs in the convention center. Nausea-inducing crowds aside, I often times find myself wandering the show floor aimlessly in an effort to find something that sparks my attention. I *could* just hang out with the friendly folks at the Telltale Games booth all day, but sooner or later, I am going to overstay my welcome. Honestly, though, the worst part is that, in the past, I have always made this trip alone, and this year would be no different, but I will cover that in greater detail with the next chapter. Well, this year, I made arrangements to attend Comic-Con on Friday, July 23rd, and encouraged a nearby friend to place his order as soon as possible. Friday quickly sold out, and he was unable to obtain his reservation, so instead, he opted for Thursday, July 22nd. Preferring to spend my day with a friend, I reserved this ticket, as well. I then requested a refund for Friday, July 23rd, but boy, am I eating those words now. 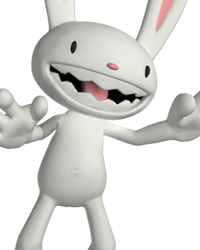 I later found out that Steve Purcell (creator of Sam & Max) would not be in attendance until Friday afternoon. Still, at least I had a friend to go with... right? This past weekend, I spotted my friend at Target, and tried to discuss our Comic-Con plans in a bit more detail. It was then that I found out that he (and his girlfriend) were going to be staying overnight in a motel. They gave me the motel information, but I really wish that they had consulted me about it beforehand. After all, I was the one that suggested going to Comic-Con in the first place. This turn of events left me with only a few days to make my final decision. On one hand, I could spend $100 on a motel, or I could spend $20 on a train. Ultimately, I decided that it would be best if I just returned home on a train Thursday evening. A few days before Comic-Con, my friend stopped answering his phone, and left me hanging. With time quickly running out, I began to seriously worry about whether or not the trip was still going to happen. So, I had no other choice but to turn my train ticket into a round trip. It was at this time that I began to get a little sick. I know now that it was just pre-Comic-Con jitters, but it was certainly not fun. Thursday came and I boarded my train, but the worst was still yet to come. When I finally managed to reach my friend on the phone, his harsh attitude shocked the hell out of me. Apparently, he was busy locating a parking space at the time that I called, but he certainly could have been a little more civilized about it, or simply not answered the phone at that very moment. We exchanged a few words that I cannot repeat here, but needless to say, we did not meet up at Comic-Con. 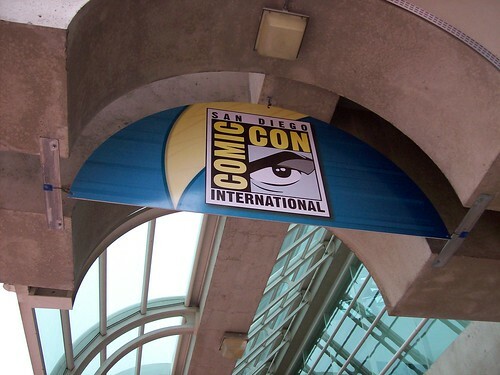 Up next, my actual Comic-Con 2010 coverage (gee whiz! ), and some closing comments. Before I left the Telltale Games booth, I picked up a few knickknacks, including the Sam & Max Button Set, Sam & Max San Diego Comic-Con '92 T-Shirt, and Tales of Monkey Island Art Portfolio. 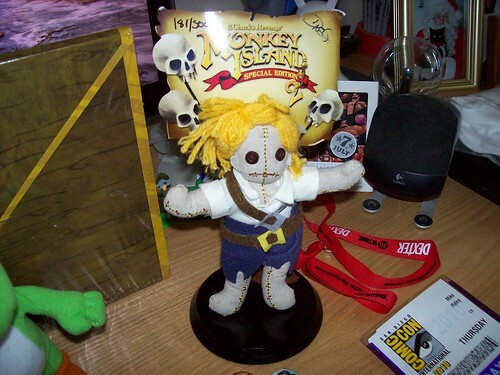 I also had Dave Grossman sign my copy of Tales of Monkey Island and the aforementioned Monkey Island Voodoo Doll. Just about everyone at the Telltale Games booth was ecstatic to see me pull that out of my bag, and now that it has been signed by Dave Grossman, it is a true collector's item. Following that, I decided to circle the convention center in an effort to broaden my horizons a bit. In the process, I managed to purchase two plushies (Shadow and Yoshi), collect a boatload of free swag, acquire discounts to Knott's Scary Farm, and "win" a trip to Miami, Florida. I have my doubts about that last one. I almost purchased an (officially licensed) Indiana Jones Fedora Hat, but was shocked to find that it was 75 bucks. There is no way in hell that I would ever pay that much for a hat. 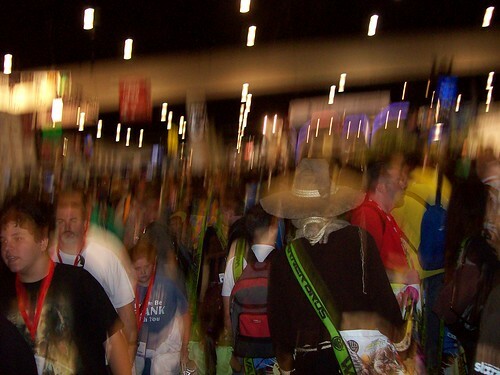 Everything quickly became a blur, and before I knew it, it was nearing closing time. Overall, this is how I feel about Comic-Con. I returned to the Telltale Games booth one last time, so that I could ask them about a certain forthcoming playtest. Yes, I am referring to Back to the Future. 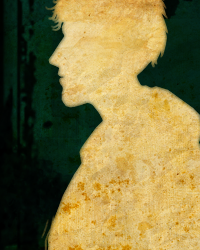 They gave me the name of the person that is tasked with adding people to the list of playtesters. Then, I bid them farewell, and made my way out of the convention center. My trip back to the train station was slow moving, but I am glad that I walked. 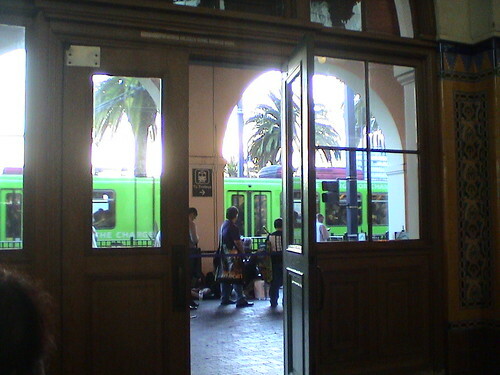 The trolley cars were super packed. They're packed into that car like sardines! I'm glad that I walked back to the train station. In the end, Comic-Con 2010 certainly had *some* good points. The massive crowds were definitely a nuisance, but it was great to once again be given the chance to mingle with the fine folks at LucasArts and Telltale Games, and the free swag was as cool as always. Still, as I described in Part 1, I have begun to tire of Comic-Con. The zombie-like crowds, the super strict security personnel, the (mostly) overpriced merchandise... It all just bugs the crap out of me, and now, it seems that it may have cost me a friend, as well. So, it is not likely that I will be attending Comic-Con again next year. I would love to visit San Diego again, but not the convention center. 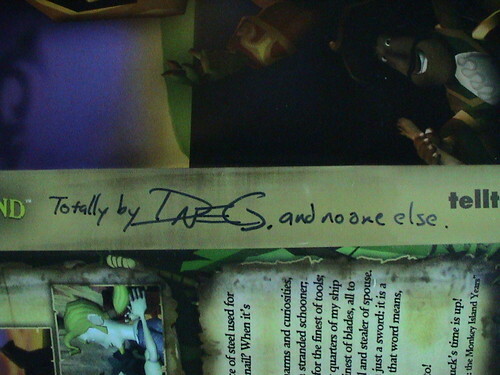 I still thank Telltale Games for giving me the opportunity to attend my first convention back in October 2007, though. Attending these conventions has been a one of a kind experience for me. Sure, there were some bad experiences along the way, but that is all part of life, right? I'm currently rushing about doing stuff, so I can't read this yet, but it looks like it'll make a good read later. I commend your journalling forum habits! The only thing I'm not so jealous about is being in a room with that many people. I've never been a fan of big crowds, but I would brave it for the Comic-Con! I didn't take any video this year, so that just about does it for my Comic-Con 2010 coverage. I forgot to mention it in the blog above, but once again Telltale Games did not have any panels. They seem to have a lot of stuff under their collective belts right now. Also, I wouldn't necessarily rule out any further conventions entirely. I am sick of Comic-Con, but there are other events that may interest me in the future. I would still love to attend E3 (if only I had the credentials to get in). That one would actually be fairly convenient for me since I live less than 20 miles from the LA Convention Center. 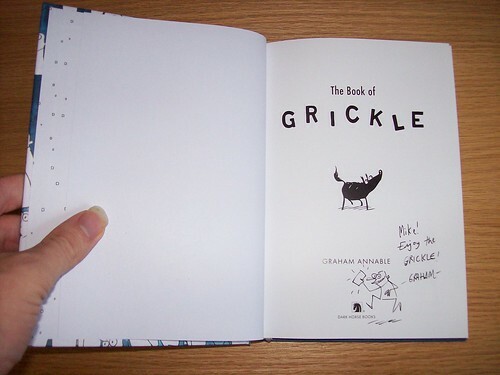 Oh, and by the way, here is that photo of my signed copy of The Book of Grickle. There's definitely something to be said for avoiding the main floor at Comic-Con. Sunday is basically the only day I can handle walking around it anymore due to the massive crush of people. I'm not keen on standing in lines for hours, either. It amazes me how long some people will wait for some little trinket.